This Norton Ghost review describes most significant advantages and disadvantages of the backup software. Norton Ghost supports integration with USB backup devices, such as Maxtor OneTouch. Backup to CD/DVD is available for image-based backup tasks only (which is very strange). Norton Ghost has a very convenient presets to back up all popular mail clients (MS Outlook, Outlook Express, Windows Mail). Also there are presets for Media Files and Photos and Images. Allows performing incremental and differential image-based backups, restoring separate files and folders from a drive image. Norton Ghost allows mounting drive images as disk volumes and accessing their data as logical drives. Supports creation of boot CD which can be used for system restoration in cases of emergency. Allows you to select which specific version of a file or a folder you need to restore through finding and listing all available versions. Supports restore files filtering. The LightsOut Restore function which allows remote restoration of computer. 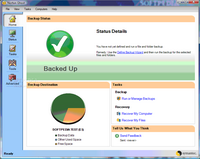 Norton Ghost allows managing backups on remote computers in the network that have Norton Ghost installed on them. Allows launching backup when changes on drive reach certain size (for drive-based backup only). Another useful feature is launching system backup before installation of any new software. Summary: Norton Ghost software review shows that, originally Norton Ghost was designed specifically for image backup. Files-based backup functionality has been added to the program in the few recent years, and it still lacks many options and general elaboration. The good side of the Symantec product is a perfectly developed image-based backup - it's good until you don't bother using the boot CD each time you want to exploit it. Used under Windows, image backup in Norton Ghost constantly tends to crash the computer which is, of course, of great inconvenience. Norton Ghost features many interesting features such as LightsOut Restore and management of networked computers with Norton Ghost. However, these features are unlikely to be used by most home users.